Kleopatra Alexandria Antonia - *Kleo* - Female, Domestic cat. Tabby. Kleo was my first cat. I got her from my music teacher in High Scool when I was 16 yrs old. He just brought her to school with him and asked who wanted her. I did ! She was only 5 weeks old when she was trusted into my care. I did not know at that time that kittens should not be removed from their mother so young. I did not know very much about caring for kittens or cats at all, but I loved her and cared for her the best I knew how. She used to sleep on top of my duvet at nights. Sucking the fabric and leaving big wet spots. Maybe because she had been taken far too early away from her mother. She had one litter with 3 kittens in her lifetime. Suzie and Luigi : Brother and sister. Black. Domestic cats. They came into our home at 7 weeks old, when my kids were young. Luigi was nutred at 7 months. Suzie had one litter. 5 kittens, Two stillborn and three alive. My kids chose one each and gave them names : Rocky, Beri and Rex. One faded away and died 3 weeks old , the vet could not tell me why, the other two got new homes and owners. Suzie became a victim of traffic and was killed. Circeline : silver tabby, female, domestic cat. We got Circeline from a vets office. She had been delivered there to be given away. Zeffi : Mackrel tabby, female, domestic cat. She now lives with my ex-husband. Zeffi had one litter before she was sterilized. 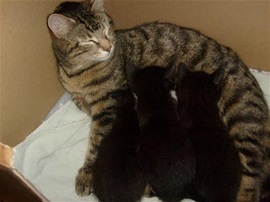 Three female kittens. Two were almost identical by looks. They were given a new home with a friend of mine. 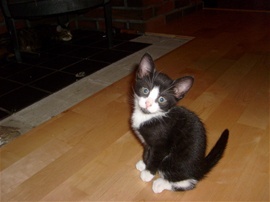 Rosie : Black and white, female, domestic cat. The third kitten was a bit smaller than her sisters and had digestion problems from early on. She was taken to the vet several times to find out what was wrong. Tests were done, medicine was tried, but nothing helped. In the end an x-ray was taken of her belly. The result was devestating. She was born with megacolon and nothing could be done to make her a healthy cat. She would have had problems and trouble the rest of her life, and when she was 8 months old she was euthanisied and given eternal rest from her pain and problems. So sad, she had the lovliest personality of all the cats I ever had. A little darling. 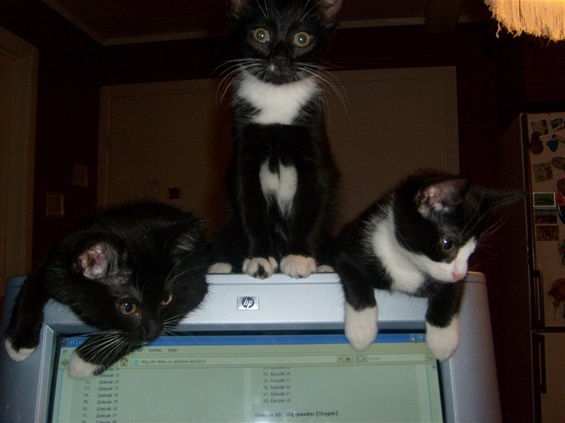 Rosie (right) and her to sisters loved to sit on top of my computer when I was surfing the net.